Heat oven to 350°F. Place paper baking cup in each of 26 regular-size muffin cups, grease bottoms and sides of muffin cups with shortening and lightly flour, or spray with baking spray with flour. In medium bowl, mix flour, 2 tablespoons orange peel, the chopped rosemary, baking powder and salt; set aside. In large bowl, beat 1 cup butter with electric mixer on medium speed 30 seconds. Gradually add granulated sugar, about 1/4 cup at a time, beating well after each addition and scraping bowl occasionally. Beat 2 minutes longer. Add eggs, one at a time, beating well after each addition. Beat in vanilla. On low speed, alternately add flour mixture, about one-third at a time, and milk, about half at a time, beating just until blended. Divide batter evenly among muffin cups, filling each with about 3 tablespoons batter or until about two-thirds full. Bake 20 to 25 minutes or until toothpick inserted in center comes out clean. Cool 5 minutes. Remove cupcakes from pans; place on cooling racks. Cool completely, about 30 minutes. In medium bowl, beat 1/3 cup butter with electric mixer on high speed until creamy. Beat in 2 teaspoons orange peel and the orange juice. On low speed, gradually beat in powdered sugar. Beat in whipping cream, 1 tablespoon at a time, until smooth and spreadable. Frost cupcakes. Garnish with orange peel twists and rosemary sprigs. Time-Saver: Use Betty Crocker* SuperMoist* White Cake Mix. Make as directed on box, but stir 2 tbsp grated orange peel and 1 tsp chopped fresh rosemary into batter. Makes 24 cupcakes. Time-Saver: Stir 2 tsp grated orange peel into 1 tub Betty Crocker* Creamy Deluxe* Vanilla frosting. Frost and garnish cupcakes as directed in recipe. 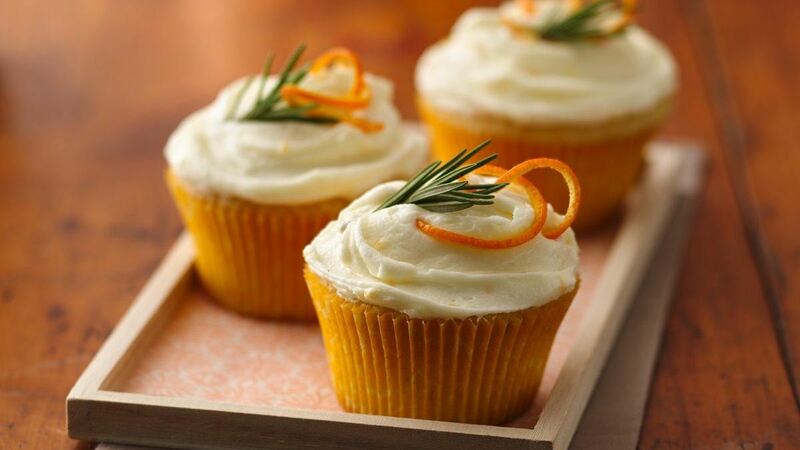 Variation: Make Lemon-Rosemary cupcakes by substituting lemon peel and chopped fresh rosemary into batter.